Commonly known as "the oldest city in the world", Jericho is an important historical, cultural, and political center located northwest of the Dead Sea. The city is perhaps best known from the Biblical story of a great victory over its Canaanite citizens by the Israelite leader Joshua. In the story, the walls of the heavily fortified city were destroyed with divine assistance during the year 1400 b.c. The site of ancient Jericho, known today as Tell es-Sultan, has been the focus of several archaeological excavations to investigate the Biblical story. The original settlement was built on a hill, or "tell". The results of these excavations suggest that the walls of Tell es-Sultan have been built and rebuilt many times, due mainly to collapse caused by earthquakes, which are common in the region. One of these events may be the basis for the story of Joshua. Modern-day Jericho is a popular tourist destination due to its pleasant climate, historical sites, and religious significance. 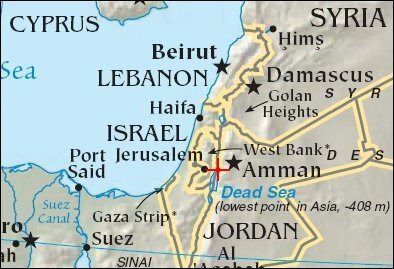 Located in the disputed West Bank region of Israel, it has been ceded to Palestinian control as part of recent treaty agreements. 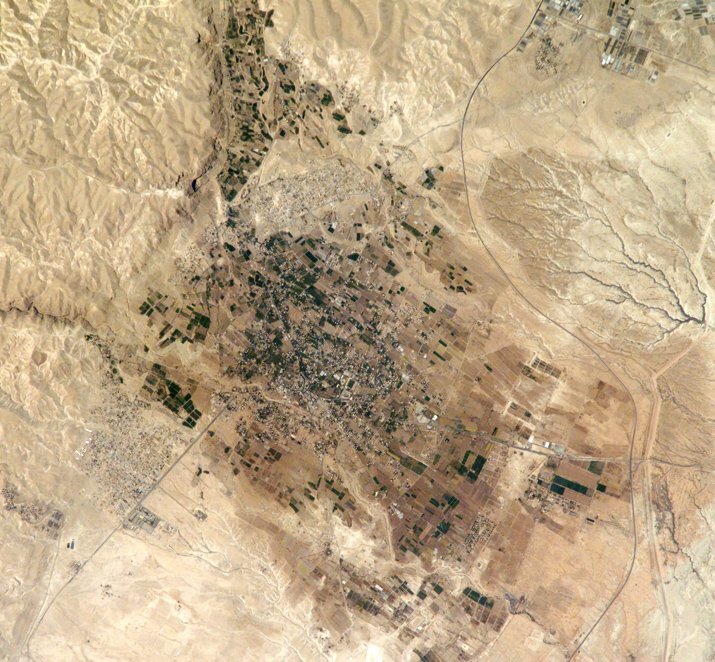 This astronaut photograph illustrates the city center, and the original settlement mound of Tell es-Sultan. Total distance across the image is approximately 8 kilometers (5 miles). Two large refugee camps are located to the northwest and south of the city center. The high building density of the refugee camps contrasts sharply with the more open city center and irrigated fields (green polygonal patches) of Jericho, and illustrates one of the physical consequences of the ongoing Israeli-Palestinian conflict in the region.